If you have difficulty viewing the MUTCD sections (in PDF format), you may need to download the latest version of the Adobe Acrobat Reader. The 2009 MUTCD, 2003 MUTCD, and certain Chapters of the MUTCD Millennium Edition (those affected by Revision No. 1 changes) may be viewed in HTML format, in addition to PDF format. Earlier editions of the MUTCD are available in PDF format only on this Web site. HTML formatted chapters are accessible to individuals with disabilities, per Section 508 of the Rehabilitation Act. The manual is set up for double-sided, offset printing to be placed in a three-ring binder. The first 3 pages include a cover page and a spine. If you are having trouble printing the MUTCD, you may need to adjust settings in "File > Page Setup" menu, in Adobe Acrobat. A high-grade ink-jet or laser printer is recommended for a quality hard copy. 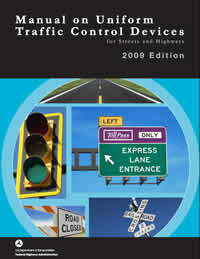 Certain chapters and sections of the MUTCD have very large file sizes due to the large page count, number of illustrations, or both, contained within (example, 2009 Edition Part 6, 184 pages with 62 illustrations). These large files can present problems when printing, depending on the printer used. This is often due to the amount of memory within the printer itself, which is often minimal, especially with the printers sold through office supply outlets. If the printer will not print the file, or prints it with errors, sending the file to the printer in smaller sections (10-20 pages at a time) often solves the problem. If you are still experiencing difficulties after making the suggested adjustments, please submit your problem to the Operations Feedback, and you will receive a reply. Learn How To Extract PDF Images from the PDF version of the MUTCD.